This entry was posted on June 5, 2013 at 5:30 am and is filed under Uncategorized. You can follow any responses to this entry through the RSS 2.0 feed. You can skip to the end and leave a response. Pinging is currently not allowed. That is a pretty cool essay. 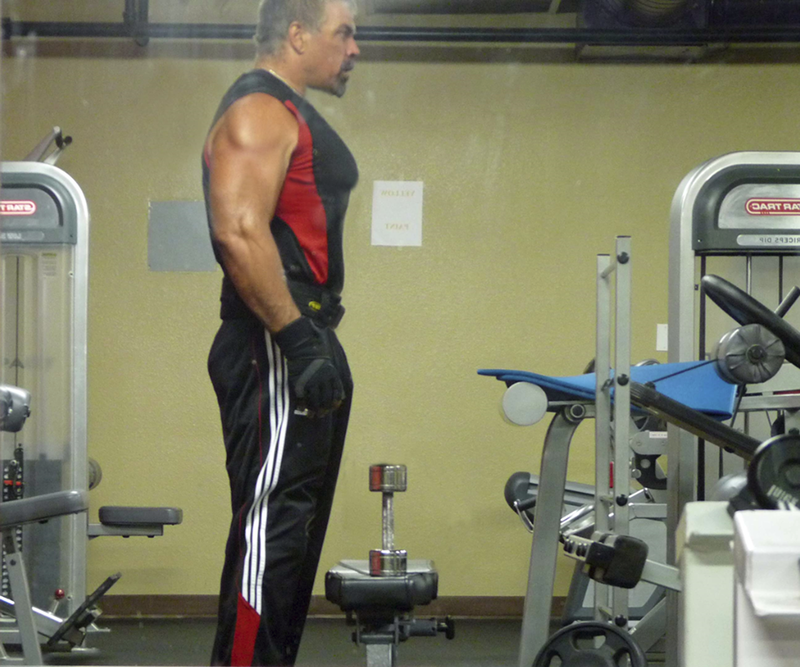 I missed the boat when it came to bulking up, so my self image is more of the tri-athlete sort of form factor. But fitness and the image of fitness is something to be valued. Maybe I should say health. God gave us these bodies. I think he wants us to take care of them. I don’t know if it says that in the Bible. My impediment to gym motivates this question. Does “Brotherhood of Iron” transcend political, philosophical or religious differences? I guess when we are focusing or actually acting or working on our health and fitness we don’t need to talk to the guy we see every other day or so about politics or that kind of stuff. If I could keep that out I might be sticking with it better. I guess don’t talk to them about it. But hell, it always comes up, and it ain’t me shooting my mouth off. I just ain’t the kind of guy that can be everybody’s friend. Wow, i was expecting a fist pumping anti Democratic slam. This was a welcome change. You let down your guard and let us know a little more about you. First and most importantly – Thank you for our freedom. As a middle aged man, I will also tell you that you are a super hero- not for your body (that’s for the girls to say), but for your service to this great Country. Second, Thank you for the motivation. I was an athlete through college and a little beyond. Over the years I also have joined the 300 club and searching for the motivation to start my quest. I am still search for a diet and work out regiment that will work for me. I don’t think you missed any boats. I mean, you may not have both oars in the water in the boat you’ve got (that being a joke of course! ), but not wanting to be muscular isn’t any more of a “missing of the boat” than WANTING to be muscular. We each of us have our own souls, our own identities, our own desires and our own aesthetics. And, yeah, you tri-athletes most certainly appear and ARE “fit.” You’re out doing it. You’re out doing what I’m talking about. We’re in different places training, but we share a lot in common. We’re both willing to “go the extra mile” to keep improving. As I’m sure you know, God liberally sprinkled the world with jerks to make the world more interesting and entertaining (that reason for “jerks” having once been provided by Gary Larson of ‘Far Side’ fame). And there are jerks in the gym, just as there are jerks in every other walk of life. I’ve had quite a few political discussions in my gym. And I always love to be surprised and find out that somebody is a LOT more conservative than I ever would have guessed. But most of the time, “politics” or “religion” or “philosophy” just doesn’t come up in our conversations. And that’s because we go to the gym focused on a particular task and we tend to talk about what we ALL have in common when we talk. My gym is owned by a couple. The wife has always seemed nice and friendly; the husband is a raging lefty. But even with him, I’ve been able to connect on certain environmental views that we share in common. It’s never easy dealing with people because you don’t always know what sets them off. But we DO know that things like politics and religion can be such triggers. And, as with family gatherings, if we’re smart, we’ll tend to focus on the “family” part and temporarily turn down the volume level of our political and religious beliefs. That comparison isn’t all that crazy: the gym is like a family in the sense that you’ve got a relatively small group of people who share the same equipment together and have to learn to get along with each other in order for everyone to get what they want. That said, there are some people who go to the gym wearing headphones. They spend their entire workouts listening to their music and don’t do much interacting. When I see somebody with headphones, I don’t bother them and they don’t bother me. Thanks a bunch for your very kind and gracious words. In a way, I AM returning to my military roots by hitting the gym: I’m on the verge of being able to wear those uniforms that I talked about for the first time in YEARS! It is SO cool to be able to put on clothes that I frankly thought I would never be able to wear again. I’d given away most of my “small” clothes; but there were just a few things that I thought, “Maybe a miracle will happen” and held on to. And in my own case, there was no way I was going to toss my uniforms. You hit on a big point in your “super hero” thing: of course neither I or anyone else is a “super hero” because of how they look. But when you consider what a hero is, there are an awful lot of heroes walking around in America. The people who served on the front lines are at the very top of that list. Of course. God bless our veterans, and I pray that God bless me as a veteran. But we can ALL be super heroes by standing up for what is right and doing what we ought to do to make our nation, our towns, our churches, our families AND OUR OWN LIVES better. There is such an obesity epidemic in America it is beyond unreal. And that epidemic and all the diseases (such as diabetes) that result from that epidemic of obesity are part of what is tearing our nation down: we simply cannot afford to pay for the health care of a sick and diseased and obese people. And when you consider that a) our food supply is less healthy and more fatty and sugary than ever before; and b) the terrible self-esteem that so many of us have, it is no surprise that we have become fat. And once you’re fat, your life turns into a vicious cycle. Because the fatter you get, the worse your self-esteem becomes. And the lower your self-esteem, the less likely that you will be able to believe that you are worth the very hard work and long process that would have to go into getting rid of that weight. I finally realized that if I loved myself, I would start doing the things that I knew I needed to do to take care of myself. And I realized that no matter how good my excuses were (example, terrible knees featuring nine screws and a plate! ), I couldn’t allow myself to be ruled by reasons why I couldn’t succeed. Rather, I needed to put my excuses aside and do what I could do. It’s a really bad metaphor for fat people who got into their rut by overeating, but it remains valid: how do you eat an elephant? One bite at a time. PLEASE don’t start eating elephants, obese people, but realize that the day you begin to lose weight you will enter into a lifelong process that will be very difficult and take a long time. But what you get on the other side is just so worth the effort. And YOU are worth the effort!!! I would encourage you to find an activity that works for YOU. Weight lifting and gyms most certainly aren’t for everyone, but if it’s for you, then join right now and get started. I also take a long walk with my dog every single day – and that walk is the highlight of my day (and my dog has definitely said that it’s the highlight of hers, as well). Find something that you enjoy doing and do it. Find something that you can become passionate about and get passionate about it. As for diet, I have never found “the perfect diet for me.” I’ve come to believe that it is ultimately a matter of calories: if you put it in your mouth, you’ve got to burn it. I’m eating more vegetables than ever. I’m eating more fiber than ever. I’m trying to learn to limit myself – or just walk away completely from – the foods that offer nothing but taste and sugar or taste and unhealthy fat. And between my much higher activity level and my much better diet, I’m losing weight at a healthy rate. I feel so much better. I look so much better. And I want that for everybody. Yes, I even want that for Democrats. I’ve never wanted this blog to be about me. But that doesn’t mean I can’t use myself as an example to communicate important ideas. Thanks again, J.C. And here’s to hoping you find what you need to fulfill your own vision for your health and for your life. I forgot to mention fun. When we get our bodies back, our muscle memory of the fun things we used to do comes back. My opinion anyway. When I was a kid I used to live on a dang bicycle. Now I am back to that. On Saturday of Memorial weekend, I started a brief vacation. US 550 between Durango and Silverton was closed to automotive traffic for a bicycle race. It is sublime when they do that. I ride that wearing a heart rate monitor. Don’t know if you know what that is about, but it reads physical exercise output in calories. So my 6 thousand feet of climbing is more or less 5000 calories. That is me burning 3 days worth of metabolism in one sitting. I am hanging out with some pretty healthy and fit people during that weekend. My sports hero is a guy named Ned Overend. He is a triathlete a couple of years younger than I. So in my mind we are kind of peers. That is a bit of a stretch maybe but it ain’t like a stretch of me imagining myself a peer with Tim Tebow or John Elway. Anyway, after a 5000 cal bike race, I take a recovery day, then the next day rent a mountain bike at a ski area and ride up the road to mountain top for 2500 cal. Ripping down the mountain bike trail. Now that is more fun than a 60 year old is allowed! Take a recovery day and do another repetition of that! So this is me describing a 10,000 calorie vacation. There ain’t nobody that will go on vacation with me. My wife used to, but she insists on a bed and breakfast. Me, I have taken to camping at 10,000 feet in order to acclimate some. Man o man! In July… Colorado state hill climbing championship. That race has a finish at 14,265 feet. I am going to do it. If I finish, fine. If I don’t I will get some good pictures. I’ve taken several 10,000 calorie vacations. But they’ve always gone the other way (you know, where I ate the buffet to put them on rather than riding a bike to take them off). What is interesting about weight lifting is that it doesn’t burn all that many calories in and of itself. Basically, as I understand it, calorie burning is more about movement than exertion. If you run ten thousand feet to catch the train, you burn more calories than if you actually push the damn train 1,000 feet. Even though you dang near killed yourself with the effort of pushing that stupid train. At the same time, when one performs an activity such as bike riding or running (or at the gym, elliptical training, for example), you burn calories, but once you’ve burnt them, that’s it. As opposed to weight lifting: because as you gain muscle, you increase your metabolism. Such that your body burns calories at a higher rate constantly. There are a lot of fascinating topics or questions for discussion about various types of exercise or sports. But many of the answers tend to depend on one’s priorities. For example, which sport or exercise is best for your health? Well, what do you mean by “health?” One might lower your cholesterol more, but the other might lower your blood pressure more. Which is healthier? Or which is harder. Is it harder to win the Tour de France, or is it harder to bench press over 1,000 pounds? And, of course, number one, they both seem pretty damn impossible to all but a very few people, and number two, it kind of depends on your physical abilities (i.e, do you have more strength than endurance or do you have more endurance than strength?). Then there are the downsides of various sports. For example, I don’t have to worry too much about getting hit by a bus in the gym or falling off a bench that is travelling at 40 mph and breaking bones. But you probably don’t worry about tearing your shoulder trying to lift your 350 pound bike over your head. Ultimately, it boils down to what floats your boat. And if you want to get on that bike and ride like a fool rather than go to the gym and lift like a fool, than that’s the kind of fool you should be. The most important thing is picking something you love and doing it. For those athletic types who think it’s OK to slack off from time to time, I found some interesting information from a recent study of elite athletes and couch potatoes. Muscle loss begins in 72 hours from the time of last physical activity, regardless of your level of fitness. Additionally, within one year without any physical activity, there’s no difference in the physical condition of the spud/couch potato and the athlete. So it seems the notion of use it or lose it is alive and well, and walking, yoga, resistance exercises, and everything in between is better for us than sitting around every day. Having let myself go to pot, and now having fought my way back from that “spud,” it’s a word to the wise. Have you ever heard of Frank Zane? Very inspiring reading, although I am not at all fond of this sort of physical training. But one can apply the same ideas and enthusiasm in other contexts; what ever you want to develop. And I like the combination of physical and mental strength with a strong faith in Jesus Christ that you represent. I wish more Christians had the same attitude. We are bodies, minds and souls, and we have to take care of all three of them. But there will be a day when we are forced to accept that the body has become old and exhausted, accept its decay and be ready to leave it. Otherwise, we risk becoming just ghosts. I see lots of victims to plastic surgery. They already look like ghosts. Immortality and eternal youth is the result of belief in Jesus Christ, our Lord and God. Trying to find it anywhere else is to fail him. God bless you Michael, my brother in faith and conviction! Very good to hear from my good friend in Sweden! Imagine how surprised I was to learn that some people had the same sort of “body image bigotry” against my weight lifting!!! I was shocked and appalled. How could anybody possibly not admire a weight lifter’s physique? Now I “get it.” I understand that it literally takes all kinds to make up a world. On my new “nuanced” view, I understand that everybody who seriously thinks about their body has their OWN vision of what they should look like. Maybe they see themselves getting bigger and stronger; maybe they see themselves as developing their muscles to a more limited extent and then cutting down fat; maybe they see themselves as the much less muscular but uber lean cyclist or runner bodies. Maybe it’s something else. It comes down to whatever floats your boat. You’ve got an image, a vision of yourself, in your soul, and you are working to make that ideal image of yourself a reality. And, yes, I thank you for noting it: I tie my physical image to my spiritual image: I am named after Michael the archangel, and I WANT TO LOOK LIKE MICHAEL THE ARCHANGEL. I am wearing Christian pendants and Christian symbols more than I ever have; because as I develop my body into something special, I want people to see who – and I mean Who – is responsible for my body. We live in a postmodern world where – unfortunately – how a person looks is all important. The beautiful inherit the earth in this world. Especially in California (where I live). Another unfortunate thing is that many of the “beautiful people” who shape so much of our culture use their physical appearance to warp culture and keep driving it downward. How many of our Hollywood beautiful people are liberal secular humanists blatantly opposed to the Judeo-Christian worldview? Nearly all of them. I want to be – to the very limited extent that I can be – salt and light in this culture. I want to bring EVERYTHING about myself captive to Christ. And harness everything to and for His glory. It is amazing what you can do – including transform yourself from “pathetic” to “strong” when you use the Bible as your guide and allow it to define your values rather than letting your perverted values define the Bible! Any upcoming posts about SCOTUS and their decisions on DOMA and Prop 8? You were reading my mind again, weren’t you? I only just today wrote an article that brought up both the SCOTUS AND Prop 8. I haven’t looked at this post in weeks, but I didn’t notice the picture near the bottom, which I assume you may of added later after losing the additional 7 pounds and that the picture is of you. I must say that you have a tremendous physique! However, I am still trying to picture you 70 some pounds heavier. If I remember correctly, I think we both started to get back in shape about the same time and that we both prefer free weights, good old fashioned iron. Although I hadn’t gained much weight, I had just simply gotten out of shape and was starting to get soft, as I rapidly approach the age of 40. I am still at it, but have struggled with a couple of injuries, the latest a hamstring pull from doing wind sprints. Hopefully, I can work out some of the kinks and continue on to the vision that I have for myself. Keep it up, Michael, and your story and picture are definitely an inspiration. Actually, that picture is about as old as the original article. I TRIED to embed it, but since I updated to Windows 8, my ability to post pictures on WordPress pretty much went kaput. I was finally able to load the picture by using my tablet. Still not able to do so on my regular computer. And WordPress – which had pretty darned good support when I started out – has virtually nothing now. But, yeah, that pic is of me (seven pounds more of me, in fact!). It’s just as well. I’ve been “shut down” for a month in terms of upper body workouts. I’m having physical therapy for rotator cuff issues, and my physical therapist (I told her that there are three levels of evil: there was “Nazi evil”; then we get more evil to “personal trainer evil”; and finally one degenerates to the true evil and enjoyment of suffering that leads one into physical therapy. Anyway, she didn’t want me training while doing physical therapy – which of course I attributed to her desire to make me suffer psychologically – which I have because DANG I WANT TO GET BACK TO MY PROGRAM. I’m continuing to go to my gym, but I’m doing leg training, cardio and abs. I wanted to keep the “gym schedule” rather than fall off the wagon and have to try to get back on it; I wanted to sustain the momentum that I’ve built up; and frankly, if you can’t go over an obstacle or through it, you keep working and try to somehow get around it. I really never intended to get back so much into weight lifting. What happened was I joined a gym and was just planning on doing modest stuff. But there was something called “muscle memory” that I’d never really heard of. It turned out that if you were big and strong at an earlier point in your life, well, your body remembered that and tried to get back to it with even a little bit of encouragement. I started seeing dramatic results and just went with that flow. That “muscle memory” thing is just amazing. The Bible calls us “fearfully and wonderfully made.” I keep marveling at just HOW wonderfully God made us. That said, I know how you feel about dealing with training injuries. Apparently many of us 40+ year-olds who are trying to recapture our days of yore are experiencing the reality that we just aint what we used to be. In addition to my rotator cuff issues (which I’ve had for several years, having once had an ortho surgeon assure me that no, I didn’t have a torn rotator cuff when yes I certainly did), I’m resting a strained bicep tendon. Stupid laws of gravity (and aging!). Best wishes to you as you also transform into your own vision for yourself, FMC.